For other people with the same name, see Alexander Campbell (disambiguation). 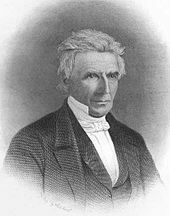 Alexander Campbell (12 September 1788 – 4 March 1866) was a Scots-Irish immigrant who became an ordained minister in the United States and joined his father Thomas Campbell as a leader of a reform effort that is historically known as the Restoration Movement, and by some as the "Stone-Campbell Movement." It resulted in the development of non-denominational Christian churches, which stressed reliance on scripture and few essentials. :111 Campbell was influenced by similar efforts in Scotland, in particular, by James and Robert Haldane, who emphasized their interpretation of Christianity as found in the New Testament. In 1832, the group of reformers led by the Campbells merged with a similar movement that began under the leadership of Barton W. Stone in Kentucky. :112 Their congregations identified as Disciples of Christ or Christian churches. Several American church groups have historical roots in the Campbells' efforts, including the Churches of Christ, the Christian churches and churches of Christ, and Evangelical Christian Church in Canada, the Christian Church (Disciples of Christ). 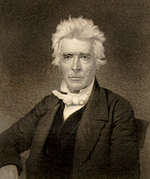 Alexander Campbell also founded Bethany College in what became Bethany, West Virginia. From 1815 to 1834, Campbell and his father kept the Brush Run Church affiliated with a local Baptist association. After disagreements over some issues, they allied with the Mahoning Baptist Association. 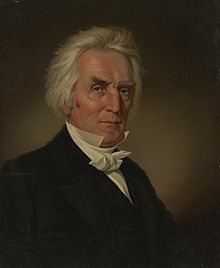 Alexander Campbell died on March 4, 1866, at Bethany, West Virginia. His widow died more than three decades later, on June 28, 1897.:136,138 His nephew Archibald Campbell (1833-1899) had already become an important abolitionist and Republican party leader, and as editor of the Wheeling Daily Intelligencer helped found what became the state of West Virginia. While in his early 20s, Campbell wrote several moral essays under the pseudonym "Clarinda." and published them in a local paper. In 1820, his debate with the Presbyterian John Walker was published, reminding him of the efficacy of writing and publishing. He bought a press and built a small print shop in 1823, establishing what proved to be a successful publishing operation. Campbell edited and published two journals. The first was the Christian Baptist, which he edited from 1823 through 1830.:174 The second was The Millennial Harbinger, which he began in 1830 and continued to edit until his death in 1866. He became less active in it during the 1850s. :517–518 In both, he advocated the reform of Christianity along the lines as it was practiced on the American frontier. He encouraged contributions by writers who thought differently from him, and the journals encouraged a lively dialogue about issues in the reform movement. Campbell expanded his printing operation in 1830 for the Millennial Harbinger. The change from the Christian Baptist to the Harbinger was prompted by several concerns. Differences of opinion were arising between Campbell and the Baptists, and in many cases Baptist associations were expelling persons connected with the Campbell movement. He was concerned that "Christian Baptist" – which he considered to be less appropriate than the biblical term "Disciples" – was becoming the de facto name of the group. He also wanted the new journal to have a more positive tone, promoting reform and preparing the world for the millennium and the second coming of Christ. For a time, Campbell was wary of public debates. In June 1820, he debated with Rev. John Walker, a Baptist preacher, at Mount Pleasant, Ohio, on baptism, and since then, regularly participated in debates. Some of them gained national and international attention after their transcripts were published. In 1823, he debated with Rev. William L. McCalla, a Presbyterian minister, on infant baptism; in April 1829, with Robert Owen on socialism and Christianity; in January 1837, with Archbishop of Cincinnati, John Baptist Purcell on Protestantism and Roman Catholicism; in September 1843, he defended the Restoration Movement in a debate with Rev. Nathan L. Rice, who represented traditional Presbyterianism. Campbell was instrumental in the Restoration Movement, which resulted in a new direction for American Christians and founding of numerous new, non-denominational churches as well as the Christian Church (Disciples of Christ). His house in Bethany, West Virginia, the Alexander Campbell Mansion, was designated as a National Historic Landmark. Campbell is known to have preached at the Slash Church, now on the National Register of Historic Places in rural Hanover County, Virginia and still used by a Disciples of Christ congregation. ^ a b McAllister, Lester and Tucker, William E. Journey in Faith St. Louis, Missouri: The Bethany Press, 1975. ^ a b c Boase, George Clement (1886). "Campbell, Alexander (1788-1866)" . In Stephen, Leslie. Dictionary of National Biography. 08. London: Smith, Elder & Co.
^ Pillsbury, Parker (1847). The Church as it is: Or, The Forlorn Hope of Slavery. Concord, New Hampshire: A. Forbes. pp. 56–58. Retrieved 30 December 2018. There is not one verse in the Bible inhibiting it, but many regulating it. It is not then, we conclude, immoral. ^ "Education from LVA: Archibald Campbell". edu.lva.virginia.gov. ^ "Archibald Campbell: A Champion for West Virginia". West Virginia Web: Your gateway to West Virginia. ^ "Archibald W. Campbell". www.wvencyclopedia.org. ^ Powell, Bob. "February 13, 1899: Wheeling Newspaperman Archibald Campbell Dies at 65". ^ Haley, J. J. Debates that made history: the story of Alexander Campbell's debates with Rev. John Walker, Rev. W. L. McCalla, Mr. Robert Owen, Bishop Purcell and Rev. Nathan L. Rice. Saint Louis, Missouri: Christian Board of Publication, 1920. Richardson, Robert. Memoirs of Alexander Campbell. In two volumes. Philadelphia: Lippincott, 1871. Wikimedia Commons has media related to Alexander Campbell. Wikisource has the text of a 1911 Encyclopædia Britannica article about Alexander Campbell.